Apple is on the cusp of launching a new initiative, pledging to use 100 percent recycled materials in a closed supply loop for fabrication of its devices -- but how it intends to do so isn't clear. "We're actually doing something we rarely do, which is announce a goal before we've completely figured out how to do it," Apple's Vice President of Environment, Policy and Social Initiatives Lisa Jackson, told VICE News in an interview. "So we're a little nervous, but we also think it's really important, because as a sector we believe it's where technology should be going." Should Apple be able to pull it off, the move has several benefits, not only for the environment, but for the company's political clout. It, and the rest of the industry, has caught heat lately for its use of cobalt sourced from the Congo in lithium batteries. Other rare earth minerals are thought to be in short supply, and reclaiming more of them than are processed now will only help dependence on suppliers. Apple is introducing the initiative now in conjunction with the 2017 Environmental Responsibility Report, before it is ready to execute to entice other suppliers into joining, and to recruit talent who can move the goal along. "Who knows more about recovering metals than people who mine them?" Jackson said. "So some of the same smart people who do that, if they think there is a market for their services on the other side might get involved." 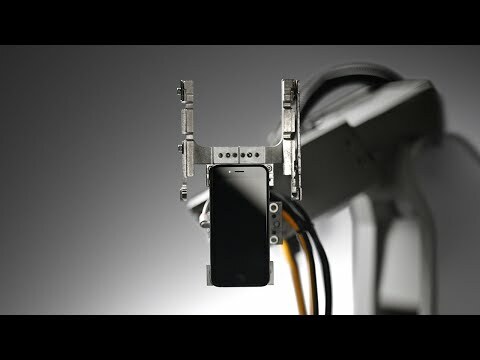 Apple debuted the "Liam" iPhone disassembly and reclaim robot in March 2016. The robot arm facilitates picking apart the iPhone and other gadgets, tearing the devices down into discreet modules. These parts, like an iPhone screen or logic board, can then be broken down further to recover materials for reintroduction into the global supply. Also introduced by Jackson, Liam allows tungsten from iPhone's Taptic Engine to be recycled into bits used on cutting tools, while silver from the logic board might make its way into vital components for solar panels. Liam also lets Apple target potentially troublesome chemicals like cobalt and lithium, which are culled from the battery. Apple has already established a renewable supply chain for its packaging. In the 2017 Environment Responsibility Report declared that Apple was protecting enough forest to sustainably produce the packaging for its two largest markets. The program started in 2015 in the US, with a buy of 36,000 acres of forest in conjunction with the The Conservation Fund. Later in the year, it expanded the initiative to encompass 1 million acres in China. Ease of repair isn't being considered. Jackson fought back against suggestions that Apple could make products easier to repair. The exec noted that the issue is complicated, both for device producers, and for consumers as well. "[It] sounds like an easy thing to say," Jackson said. "Technology is really complex; it is sophisticated to make it work, to ensure that you have security and privacy, [and] that somebody isn't giving you bad parts." With the "bad parts" remark, Jackson is likely obliquely referring to the "error 53" debacle, where an iOS update was bricking phones with Touch ID components replaced by a third party. Error 53 codes began popping up on user iPhone 6 series units from at least early 2015, but the issue gained public notoriety when media outlets reported the supposed glitch in early 2016. Devices affected were rendered inoperable, until Apple pushed a software fix to rectify the problem -- but leaving the Touch ID sensor deactivated. Apple notes that in 2016, 96 percent of the energy used at global facilities came from renewable energy, with 100 percent attained in 24 countries and data centers. Additionally, Apple Park is on track to be the largest LEED Platinum certified building in North America. To facilitate the 100 percent recycling goal, Apple has identified the substances present in more than 20,000 components -- doubling what it tracks in a year. Apple has also continued to eliminate toxins in its products. Since the last report, beryllium has been eliminated from all new product designs, plus PVC and phthalates have all been replaced with thermoplastic elastomers. It's good to have goals, I suppose. Hard to see how they can possible have 100%-from-recycled-materials batteries and what-not. Oh, maybe their next big thing will be Wall-E scavenger robots! I suppose in the highly controlled industrial environment of Apple, it might be possible to actually recycle plastics. In most of the world, plastics are only re-used, not recycled. Recycling means a material can be taken back to it's original form and purity retaining all characteristics it had at the start. Aluminum, glass and steel all easily do this. Plastics most always cannot do this. It's too hard to remove the impurities and/or return the material to it's original form. I suppose if you choose the plastics for your products carefully you can increase the chances of successful recycling. This limits your design choices of course. So, they're finally going to use 100% post-consumer materials in their packaging instead of going on about that "forest replacement" greenwashing claim and stop making their ridiculous packaging out of new materials (including all that wasted plastic film)? So, Liam is going to actually be upscaled from a proof-of-concept Apple image promotional machine to an actual, working, industrial materials-processing system? Wouldn't they have to stop changing the device builds (to satisfy moaning tech people who want arbitrary change to product every year) to make Liam practical? So the new iPad not only has the same case size as the old iPad Air, it IS a case from an old iPad Air? /s. Lofty goals and interested to see how they word it let alone achieve it. It is actually reusing the recycled materials or is it offsetting . I for one salute Apple for these steps they are taking. We all need to care about what kind of world we're going to leave for Keith Richards. I am really, really, really enthusiastic about this. Especially the bit about future products. Waiting..waiting...waiting. I don't see how they can recycle electronics. Plastic, glass and metal, yes, but the rare materials that go into the PCB and chips nope. Now consider that chips are mostly just silicon (basically sand) and ceramics, the only way you recover those materials is by bathing them in acid, and then precipitating the materials back out. That would generate a LOT of waste, so I'm not sure what they are going to do here. I suppose they could use machines to shred old electronics, use a magnet to pull the metals out for re-smelting, and then try to recover the other materials. But knowing how "recycling" works in reality, all these things just get incinerated. I think I have this correct...the 11 Toyota manufacturing plants in Europe are "zero" waste. If only all US companies would do same. "Apple promises future products to be made from 100% recycled materials." Possibly, but that didn't seem to be statistically significant of a failure. I think Jackson wasn't obliquely referencing a slight PR kerfuffle but directly referencing a security and privacy issue, such as servers with a 'bad' snooping part inserted by a man in the middle from some snooping organisation, like umm … oh it's right on the tip of my tongue, dang.